Answer: Many people have asked me about this “large rising Moon” phenomenon, perhaps because the effect is so visually striking. Alas, it is only an illusion. You can prove this to yourself by holding your thumb up at arms length and superimposing it over the rising Moon. Note how your thumb appears just about the same size as the Moon. Try this again a few hours later, when the Moon is higher in the sky and appears smaller, and you will find the Moon’s size unchanged. What’s happening here is an optical illusion caused by the background. When the Moon is near the horizon you see it next to tiny distant objects, so it appears larger by comparison. When it’s higher in the sky, all by itself in empty space, you lose that comparative reference to size. It’s a lot like the old optical illusion recreated above. The two cacti are identical in size (measure them if you disagree). 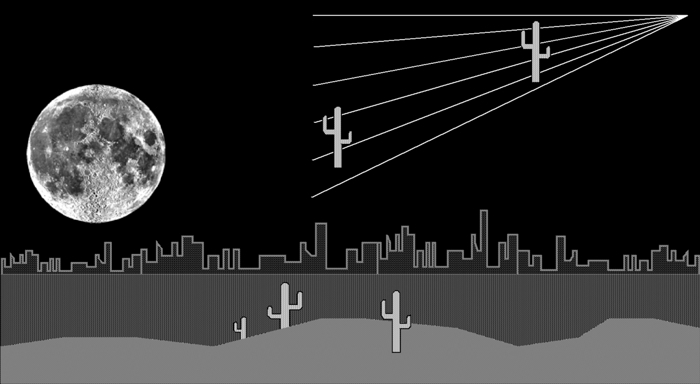 The diverging lines in the background trick the eye into seeing the right cactus as larger. Same thing happens with a rising Moon, Full or not, and with constellations too. In fact, the rising Moon is about 4000 miles farther away compared to when it’s directly overhead. Exact measurement of a rising Moon would show it to be about 2% smaller.